Every so often, I encounter a book whose author has managed to give voice to feelings I have, points I want to articulate, and perspectives I want to share. 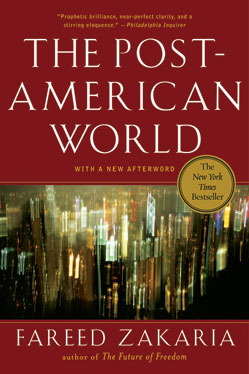 Fareed Zakaria’s “The Post-American World” is one such book. As an American citizen living outside of the United States for an indefinite period of time, I’ve been privileged to gain a lot of perspective on the world as a whole and America’s position in it. Both living here as well as in Hong Kong a decade ago, I’ve seen things that make me want to run back to my fellow countrymen, shake them by the shoulders and deliver the message: The world is different than we thought! Much like the ancients who thought the world was flat or that the Sun orbited the Earth, Americans are largely convinced that the United States is the most important country on the planet. Yes, America is the “most” in several different measures, but the ugly truth is… that doesn’t make us the most important country. There are other countries out there and their importance relative to their size, economic output, military power, etc. is definitely on the rise. I won’t launch into a sermon about how Americans need to get their heads out of the sand and better understand what’s happening in the world. Suffice it to say that Americans need to get their heads out of the sand and better understand what’s happening in the world. Zakaria’s book is a good, balanced place to start. Zakaria, who was born and raised in India but has lived in the United States for a quarter century, is the editor of Newsweek International. In his book, he describes “the rise of the rest” – the political and economic ascendance of countries such as China, India, Brazil, South Africa, Russia and Kenya. He does not write about the fall of America, but rather how America’s position as the sole superpower will become a lot less lonely, and what that means for America. The short answer is: we need to get real and get our act together. This rise of the rest presents enormous challenges and enormous opportunities, if we are willing to recognize and act on them. I encourage you to seek out and read this book. It is incisive and well thought-out, drawing on the lessons of history and steering clear of partisan ideologies. I hope you enjoy it. This week I figured it was time to try making something new. A chance to expand my skills and push the edges of my comfort zone. 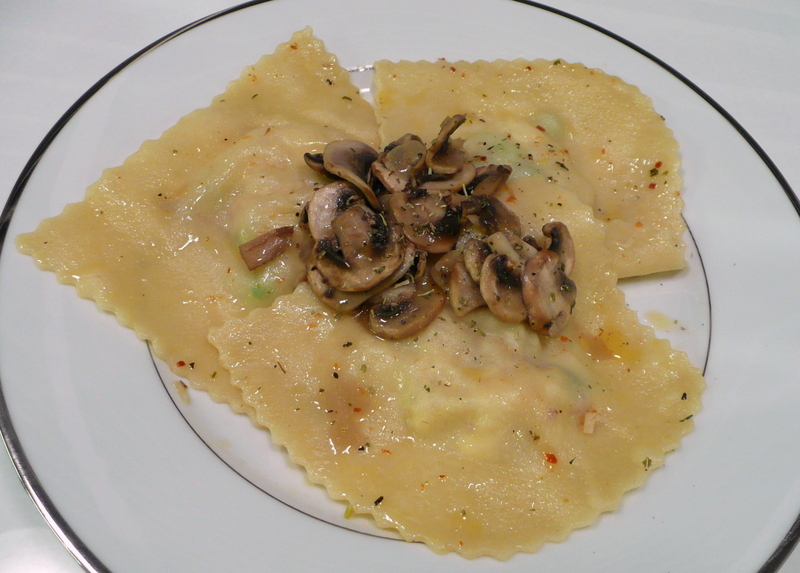 The new Everest to summit: ravioli. 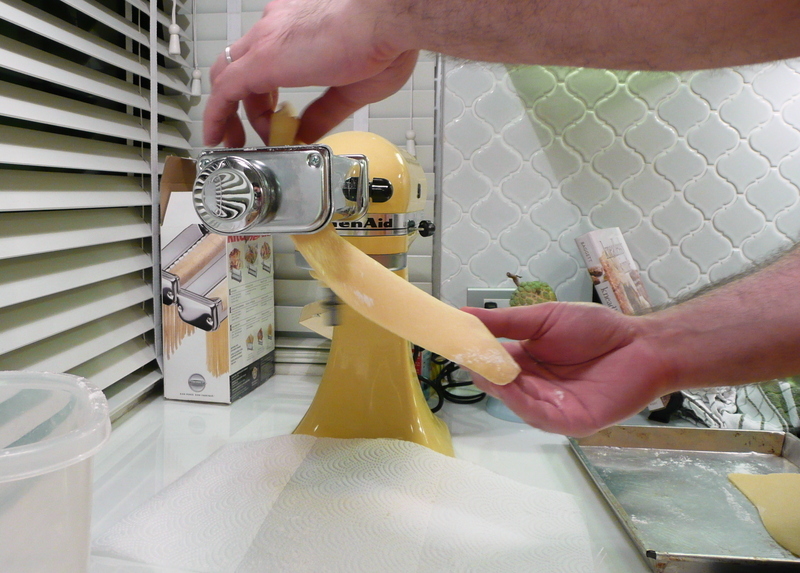 Last October was my first attempt at making pasta, using my handy Kitchen Aid mixer pasta roller attachment. It was easy enough… a little bit of work but the end result was well worth it. What I really wanted to try, though, was raviolli. After our wedding reception at Lidia’s Kansas City, the first restaurant of Italian chef Lidia Matticchio (of public broadcasting fame), we were given a copy of her cookbook “Lidia’s Family Table” as a thank-you gift from the restaurant. 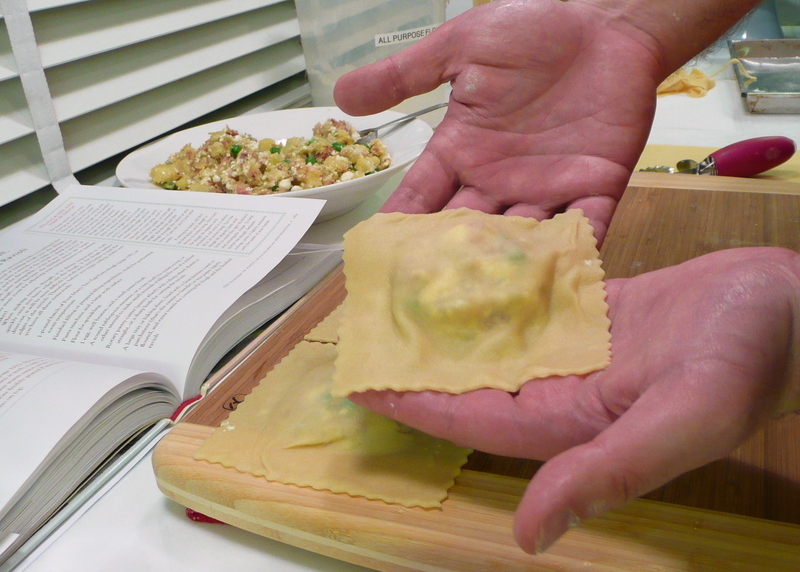 Thumbing through the recipes after returning to Krungthep, I came across one for Potato, Leek and Bacon Ravioli. Just thinking about that combination of flavors made my mouth water. Since I had guests coming over for brunch on Sunday, I decided this might be just the thing to serve them and prepared a midweek test batch to familiarize myself with the process. The first step was to boil the potatoes, whole and unpeeled, in a pot of unsalted water until they were just cooked through, about twenty minutes. After pulling them out and letting them cool a bit, I peeled them then sliced them into approximately 1/4-inch slices. Next up, I heated the oil in a skillet then cooked the bacon for a few minutes until most of its fat had rendered. Then I added the leeks and cooked a few more minutes until they were wilted and sizzling. 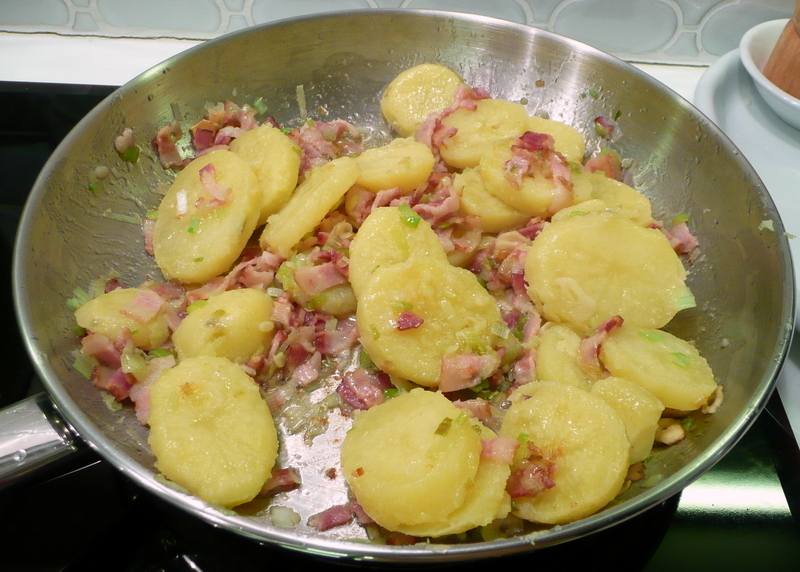 Then I arranged the potatoes in the pan, seasoned them, and stirred them around, breaking the potatoes into smaller pieces but still keeping some chunks. After the mixture was softened and starting to caramelize, I pulled it off the heat. 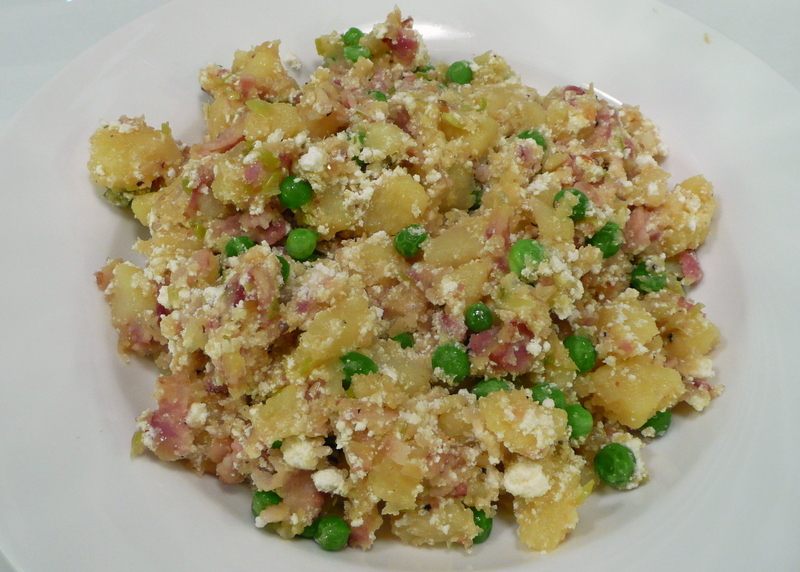 Then, deviating from the recipe (because I can’t seem to resist improvising), I added some frozen green peas and a bit of ricotta cheese. I also shaved in some Parmigiano cheese then tasted and corrected the seasoning. It needed a bit of a bite, so I added several generous pinches of dried chili flakes. While letting the filling cool, I started the pasta making process, making one pound of pasta dough with a two-egg recipe that combines both semolina flour and all-purpose flour. The goal is to get the pieces about five inches wide. Laying out the strips, I dropped heaping Tablespoons of filling about four inches apart. Lesson I learned: better to work with only a quarter or half the total batch of dough at a time, keeping the rest of it wrapped in plastic so it doesn’t start to dry. By the end of this process, I was suffering from some cracking dough. Brush with egg wash between the mounds of filling, add the second layer, press to seal and then cut with a pasta cutter or a knife. The end result looks like a ravioli, right? I was going to make a butter and sage sauce but didn’t have sage, so instead did a butter and olive oil sauce with sauteed mushrooms. Again, improvisation seems to be the name of my game when I’m in the kitchen. Boil the pasta for just a few minutes until done. 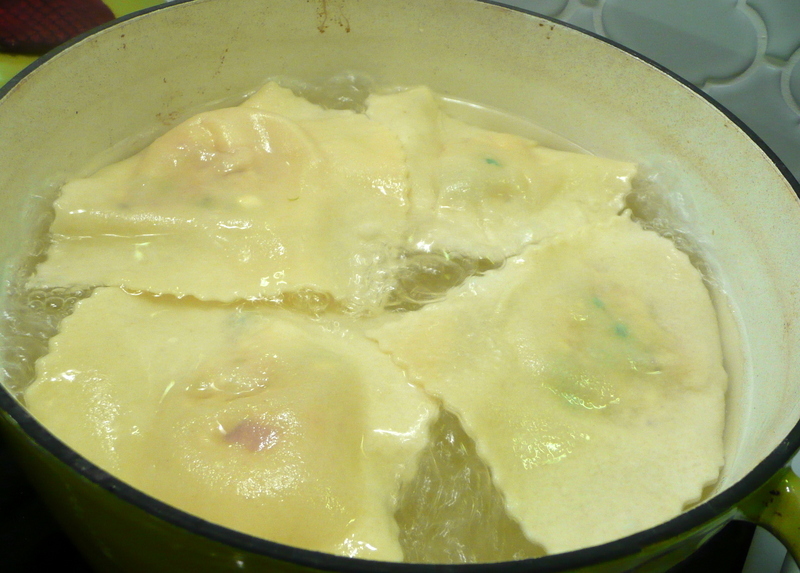 This was a pain as I couldn’t boil enough of these big ravioli at a time, so then I couldn’t sauce enough at a time, so if I had to serve more than two people at once, some of the ravioli would sit on the plate, cooling, while the others were being cooked. I’ve got to get my timing down better. 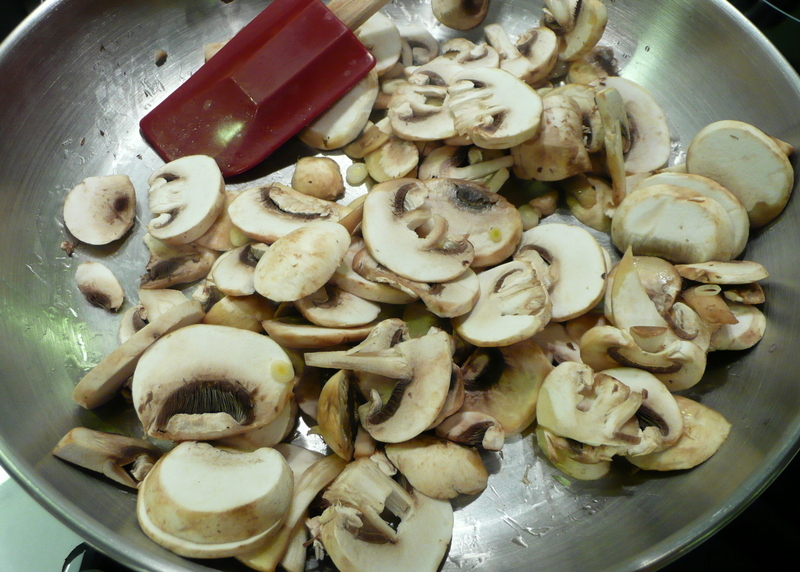 Sauced them up with the butter and olive oil, added some Italian herbs and pepper flakes along with the mushrooms. These were really tasty. I also prepared some with a traditional tomato sauce (from a jar!) which were also very nice. Satisfied with my test run, Saturday afternoon I prepared two more batches of dough as well as some more filling. For the dough, I made one batch with the basic dough and a second batch with beet root that produced a lovely magenta hue. I wrapped the dough in plastic and let it rest in the regrigerator overnight. Sunday morning I was up early and amidst a thunderstorm rolled out and filled the ravioli. 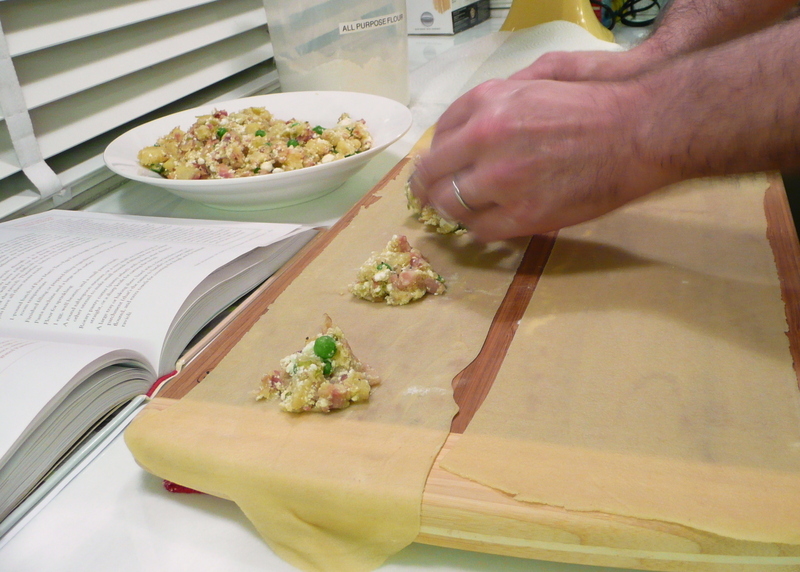 Everything looked to be coming together nicely and I laid the ravioli on wax paper sprinkled with semolina flour, wrapping the trays with plastic and setting them out to await cooking. Sadly, something went terribly wrong. Maybe it was because they were out for too long (about three hours before cooking) or maybe the filling was too wet (I don’t think so, though, as it seemed very dry) or maybe the dough had been refrigerated too long (although it seemed to have a good body to it as I rolled it), but my ravioli started to disintegrate before cooking. While sitting on the trays, the dough around the filling literally came undone, turning gummy and tearing when I tried to remove the ravioli from the tray. I discovered this after my guests had arrived and already enjoyed an appetizer of white bean and olive bruschetta and were well into the Bloody Marys. Sadly, I had no Plan B. There was no dry pasta in the cupboard and nothing else I could whip together as a main course. Sadly, I had to apologize to the guests, who were all very understanding, and Tawn called Pizza Mania to have some pies delivered. While waiting for the pizzas, we continued with the salad of oven-roasted vegetables and feta cheese accompanied with homemade bread. In fact the bread, which I also used for the bruschetta, is kind of a pleasant surprise. On a whim, I decided to use my baguette pan again. You’ll recall that a year ago June, I had a terrible experience where my loaf of bread stuck to the pan, expanding through the thousands of perforations and taking a good hour of manual labor to remove and clean up. Suddenly, while preparing these loves and shaping them, I realized what I had done wrong. Out of the blue, the light went on in my brain: the mistake I had made was putting the dough in the pan for its final rise, giving the dough the opportunity to rise into the perforations. Instead, I covered the pan with a well-flowered tea towel and let the dough rise on the towel. Then, when it was time to bake, I just lifted the dough off the towel and back onto the pan. 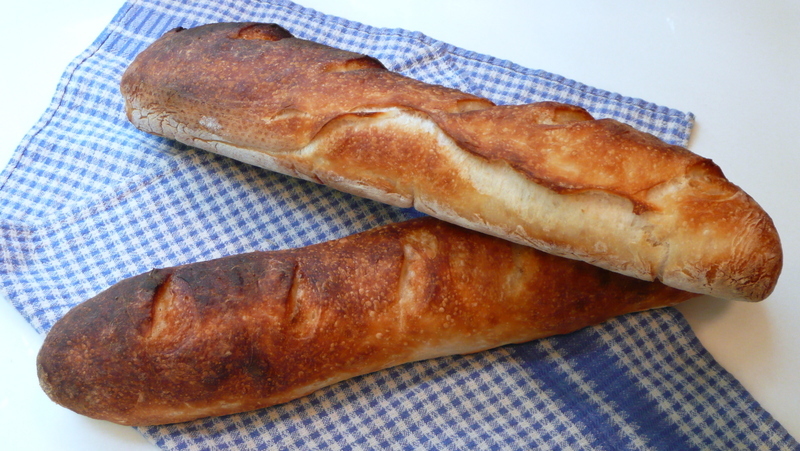 The result: the loaves baked in the baguette pan without a hitch. The four-hour brunch ended up a success, despite having to order the pizzas. The company was wonderful, including Doug’s brother Alex, who had kindly spent a day showing us around his neighborhood in Tokyo when we were there this past Spring. Bob joined us as did Benji, so we had a really interesting mix of people. The roasted vegetable salad was a hit – I was pretty pleased with it, myself – and the bruschetta and bread were well-received, too. 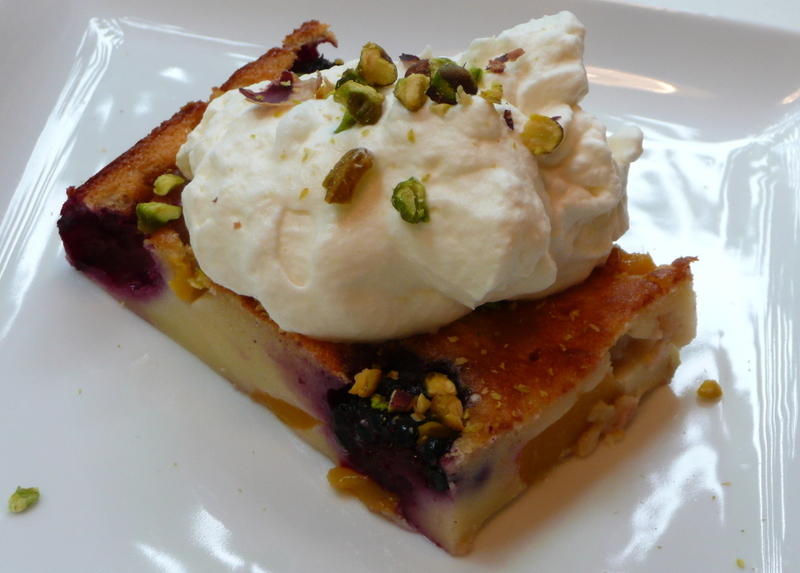 For dessert, I made a mango and blackberry clafoutis, pictured above. I really like clafoutis but I need to revert to my original recipe, which was lighter than the one I used. The addition of some baking powder would be helpful to give it some lift. So the cooking experience this week was mostly positive, but with a nice dose of humility kicking me in the teeth, just to keep me honest. Settling back into the routine here in Krungthep, I’m reminded why I carry my camera with me most everywhere I go. There is always something interesting to see. On Wednesday I had to run some errands. I drove to the Ministry of Labor to retrieve my work permit book, the address of which I had modified to reflect the “annex” unit we bought next door to our condo. Then I continued to the post office to mail wedding thank-you cards. Next I headed to UOB Bank to drop off some paperwork. Finally, I stopped at Emporium mall to have some pho at Little Hanoi restaurant. 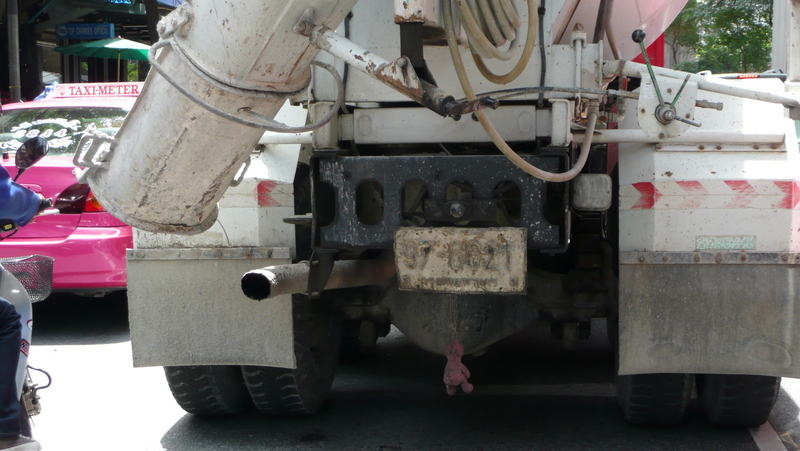 While sitting in traffic on Sukhumvit Road, I noticed something odd about the cement truck in front of me. Dangling between the rear wheels was a dirty pink stuffed animal, akin to an Ugly Doll but probably not a branded one. I’ve seen this before. In fact, about a year ago I was noticing this on cars and trucks of all types here in Krungthep. To this day, though, nobody with whom I’ve spoken has an explanation. Why would you tie a stuffed animal at the back of your vehicle? 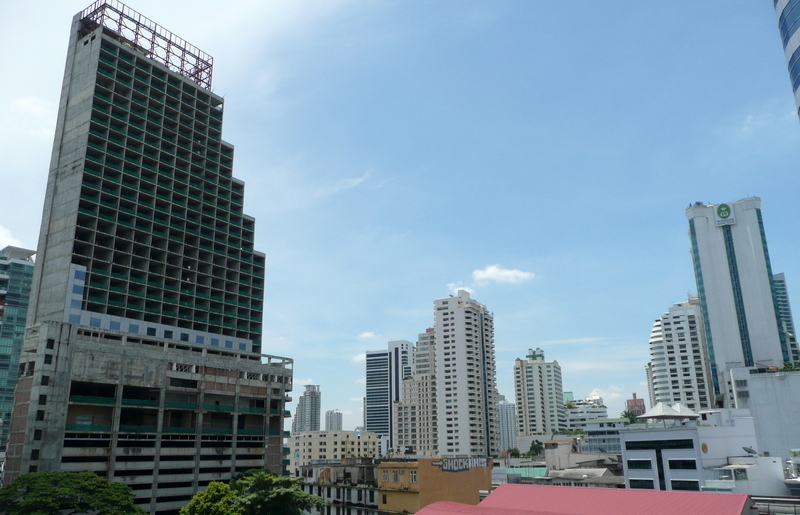 From the carpark at UOB Bank (the Sukhumvit 25 branch), I snapped this picture of an unfinished hotel. This is supposed to become a Crowne Plaza property at the corner of Sukhumvit Soi 27 but the developer halted construction about six months ago, ostensibly in response to the lousy tourism market. It is very well-located, just a few blocks from the Asoke/Sukhumvit junction and the Skytrain and Subway stations there. to the right of the picture you can see the Windsor Suites hotel, managed by our friend Ben. Very nice hotel and also well-located. If you’re looking for a place to stay in Krungthep, I recommend it. Tawn was very inspired by our trip to New York, taking careful notes on the styles and looks he saw on Manhattan’s busy streets. Above is one of his work outfits that he put together as a result of his inspiration. What do you think? 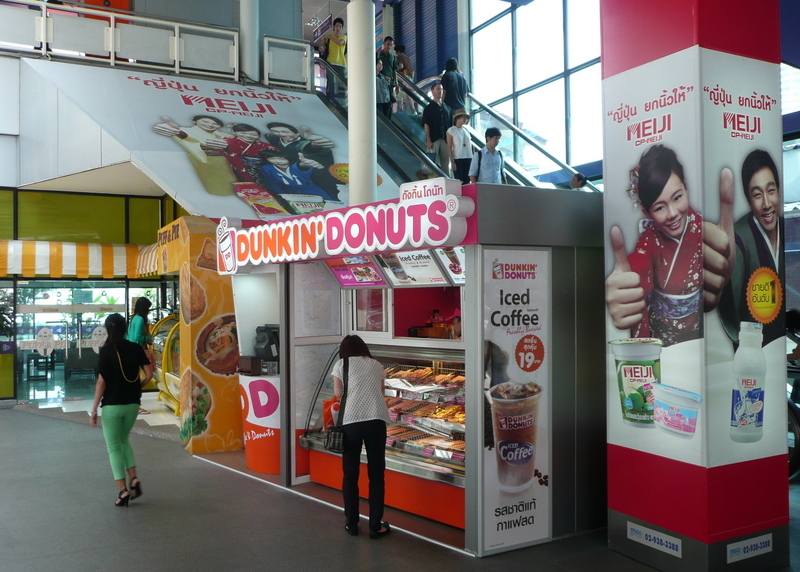 Speaking of New York, I returned from my 24-day trip to the US only to discover that a Dunkin Donuts kiosk has opened underneath the escalator connection from the Asoke Skytrain station to the Sukhumvit Subway station. See, the Big Mango is just like the Big Apple! Since my return, I’ve resumed my twice-weekly classes with my Thai tutor, Khruu Kitiya. For the past two and a half years, we’ve been meeting at the same place, a small coffee shop and restaurant called Bitter Brown, also close to the Asoke/Sukhumvit junction. 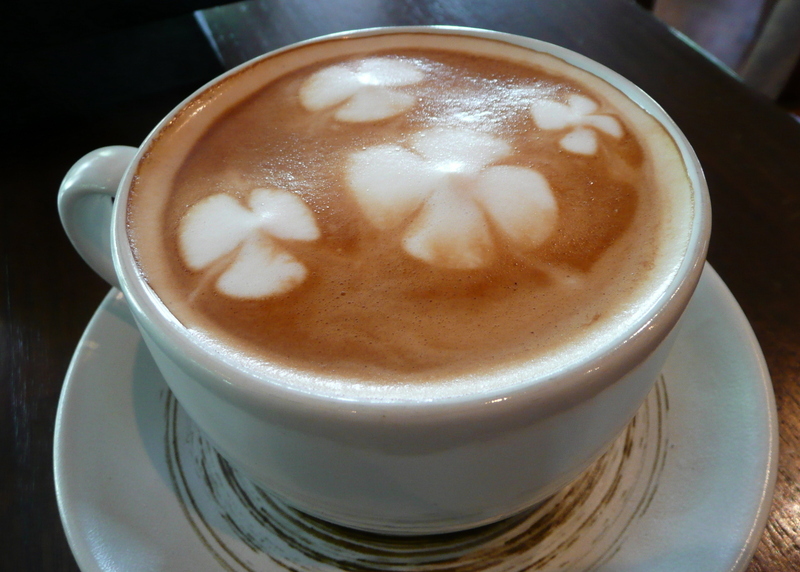 They make cute latte art, like the flowers above. After having been gone for nearly a month, the owner was a bit shocked to see me again. “We thought you must have graduated!” he said, upon seeing me. Dictation of questions and multiple-choice answers, in which you have to indicate the correct answer on an exam sheet. Reading of questions and multiple-choice answers, in which you have to indicate the correct answer on an exam sheet. A writing section composed of two parts: Dictation of paragraphs which you have to correctly write on the exam sheet, and then the composing of a short essay based on a question or subject given during the exam. An oral section in which you have to engage in a ten-minute conversation with an evaluator. Khruu Kitiya’s assessment, with which I concur, is that the first two parts would be very easy for me, the writing section would be challenging (the essay would be harder for me than the dictation), and the oral section would be a killer. This is because the one thing I don’t spend much time doing is actually speaking with Thais, since I work from home and my work is in English. As she has suggested before, Tawn and I should probably start using Thai as the spoken language at home. Contrast this with Jon, a 19-year old Canadian with whom we had dinner Thursday night. Jon first contacted me through this blog more than a year and a half ago, when he was on a one-year Rotary Club exchange program here in Bangkok. He finished that program and returned to complete his senior year in Edmonton, with the plan of returning to Bangkok after he has his university degree. 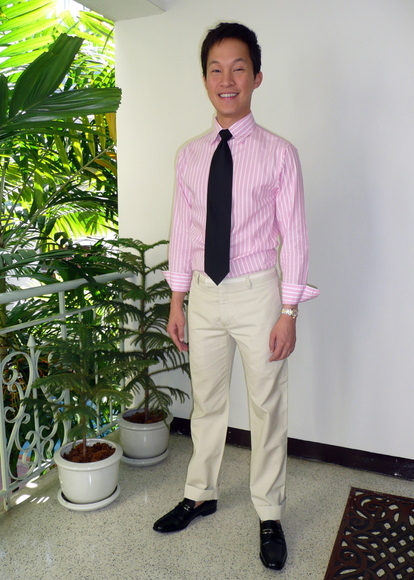 Jon spent most of his year here immersed with Thais – Thai students, Thai friends, living with a Thai family. Then on this current two-month trip, the circumstances have been the same: all Thai, all the time. Needless to say, his spoken Thai is way beyond mine and I was humbled by the ease with which he and Tawn were able to converse. Clearly, there is still some work for me to do! The good news is, the “Saab Bor Hok” isn’t until the end of November, so I have time to prepare for it as well as time to decide whether or not I even want to take it at this time. View from my balcony on Friday late afternoon. 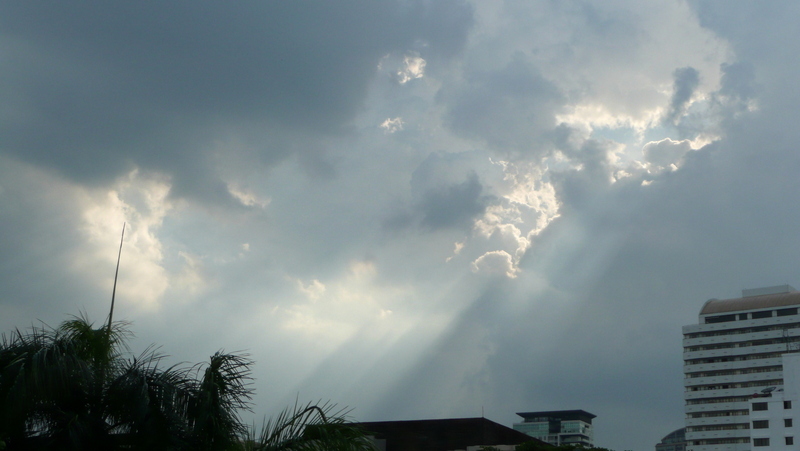 We’re in rainy season and there were some spectacular storms this week. The best part about it, in my opinion, is the way these awesome (and I mean that in the original sense of the word) clouds form: huge, complicated things that build into dark, angry towers. They are amazing to watch. Lots of cooking to update you on in the next entry. Several years ago I worked with a man named Mik. Mik was a trainer on my team and he had this fantastic spoonerism he would share during a week-long training class. He told it during the section about effective communication, although its primary purpose was to serve as a mid-week tension breaker. Try reading it and see if you don’t enjoy it. Once upon a time in a coreign fountry, there was this girl named Rindercella. Rindercella lived with her Mugly Other and two Sad Bisters. In this coreign fountry there was also a Pransom Hince and he decided to have a bancy fall, inviting all the stabulous and fylish pich reople from riles amound. The dig bay came and as Rindercella’s Mugly Other and two Sad Bisters were leaving in their dancy fresses and shancy fooes for the Pransom Hince’s bancy fall, Rindercella just crat down and sied! When Rindercella arrived at the Pranson Hince’s bancy fall, the Pransom Hince wecretly satched at her from behind a widden hindow and, seeing her punning steauty, he lell in flove. The two of them nanced and nanced all dite when sol of a udden, the slock clucked nidmite! Rindercella staced down the rairs and when she bleached the rottom, she slopped her dripper. As you can guess, the Pransom Hince found the slass glipper and decided that the very dext nay he would set about his rather’s koyal findom to find the fady’ss loot that the flipper would slit. When the Pransom Hince came to Rindercella’s house he tried the sass glipper on first the Mugly Other and you know it fidn’t dit. Then he tried the sass glipper on the two Sad Bisters’ felly smeet, and again, it find’t dit. Finally, he tried the sass glipper on Rindercella’s foot and fid dit, and the two of them heaved leverly after effter. So the storal of the morey is…If you every go to a bancy fall and want to lull in fove with a Pransom Hince, you’ve gotta slop your dripper! Along the same lines, there is a fascinating photo series by Vancouvery photographer Dina Goldstein titled “The Fallen Princesses Project“. Bristling against the beauty myths that Disney perpetuates through their “princesses” series, she imagines “happily ever after” being replaced with a more realistic outcome that addresses current issues. 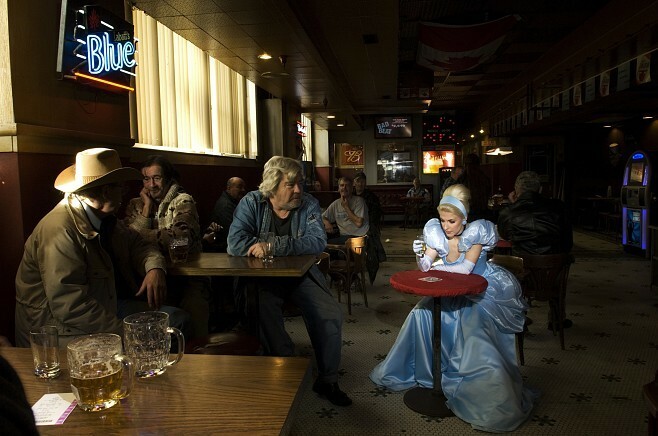 Above is Cinderella, sitting alone in a dive bar, drinking. The other images in the series are much more provocative, but I won’t steal Goldstein’s thunder by reproducing them here. Please go visit the article at the JPG Magazine website. Sunday morning after a breakfast of homemade buttermilk biscuits and French Press coffee, Tawn, Bob and I set off to Samut Songkhram province, some 90 km southwest of Krungthep, for a visit to Ajarn Yai. One thing she really wants is to take a visit to the United States. As a young lady, she was accepted to study at a university in Michigan, but her parents felt it was too far to send a woman to study, so she instead attended school locally. She now has three Master’s Degrees, including one in Special Needs Education, and even in her retirement serves as a mediator for the local courts and also as part of an adult vocational needs training program in this rural province. She still asks, though, when I’m going to take her to the United States to visit my family. After a nice seafood lunch at a small, riverside restaurant, we drove to the community of Amphawa, where a popular weekend floating market is located nearby the birthplace of King Rama II. This market is supposed to be a nighttime market, but due to its popularity, by early afternoon the boats were out and tourists (almost exclusively Thai) were strolling along the crowded sides of the canal. The area of the market has been expanded to the north, opening up more space for the overflowing crowds of tourists. Dozens of weathered buildings have been unshuttered, turned into restaurants, gift shops, homestays and boutiques. While this is good economically for the town, the crowds threaten to make the quality of life less pleasant and relaxed. Signs, both in English and Thai, have been put up warning people to be aware of pickpockets. 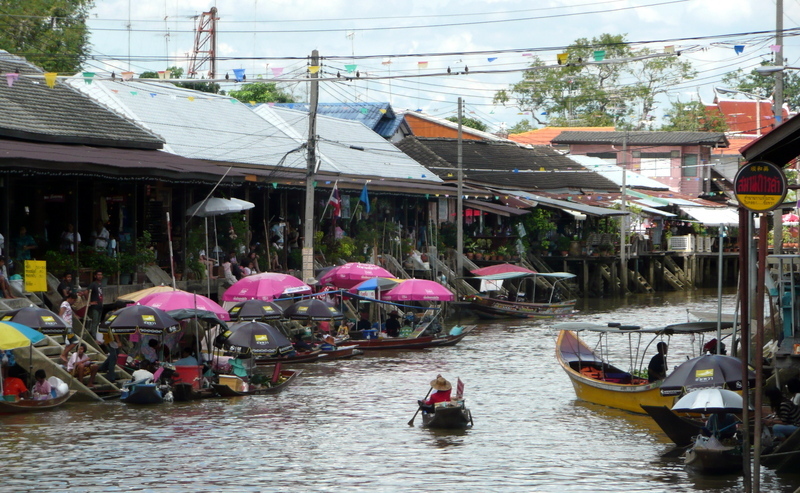 Amphawa, at least this small section of it, may end up being a victim of its own success. 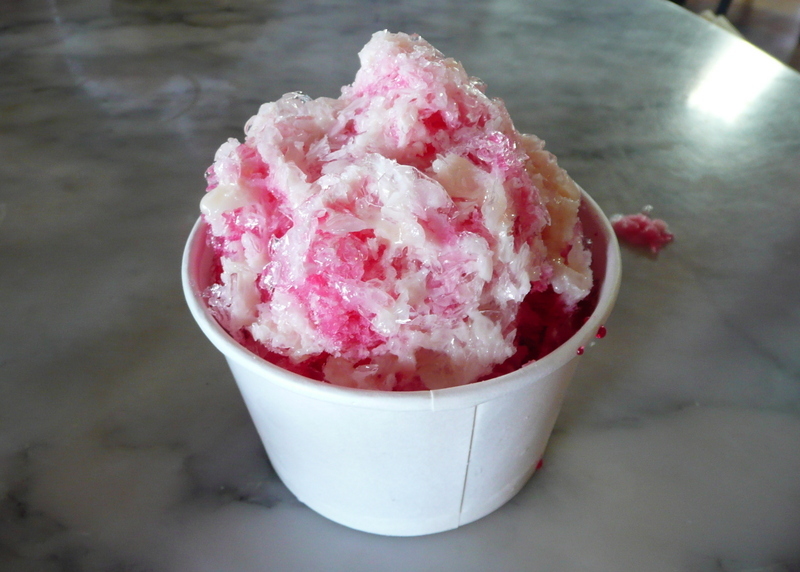 The heat was intense and muggy, no rainstorms in sight to offer so relief, so instead we ducked into one of these new cafes and enjoyed a shaved ice dessert. You could choose three “add-ins” from things like corn, Job’s tears, kidney beans, hearts of palm fruit, etc. These were topped with a mound of shave ice, a drizzle of flavored sugar syrup and, if you like, sweetened condensed milk. After a bit more visiting we dropped Ajarn Yai off at her home and headed back up the highway to the Big Mango, glad to be in the air conditioning. What Are My “Must Eats”? Sorry to report, but I’m suffering from a bit of post-vacation depression. Okay, maybe “depression” is a bit too strong a word, but in the nine days I’ve been back, I have had more than my fair share of “Oh, this isn’t any fun… I wish I were still back in New York on holiday” thoughts. Deciding to not be gripped by this emotions, I tried to take the detached, Buddhist approach and examine it. What was at the root of these feelings? The answer, I realized, was food. 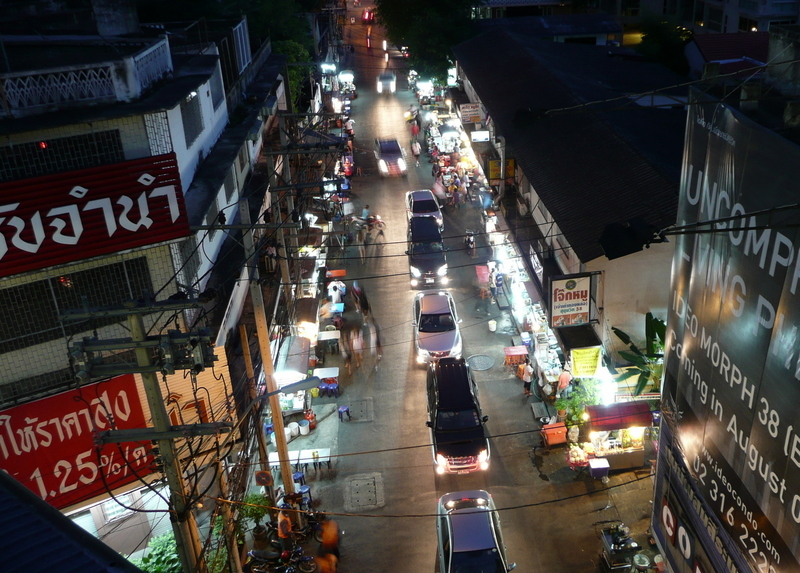 Above, Sukhumvit Soi 38, the nighttime “Food Street” near my house. Upon examination, I concluded that one of the things I like most about any place is the food. I could write a lot more about this (and possibly will in a future entry) but I think that food is really the tent pole of a culture to which I tether my experience and perceptions. As I think about places I’ve lived and places I’ve loved (to visit), specific food memories come to mind. These usually revolve around not just certain dishes, but even specific restaurants or vendors where I had especially good versions of those dishes. The sauteed mushrooms with garlic at Cha Cha Cha in San Francisco. The gyoza at Rising Dragon in Ueno district, Tokyo. The bistecca alla fiorentina at Ristorane del Fegioli in Florence. The bánh xèo at that little outdoor restaurant in Saigon, the name of which I now forget and would have to look up. The truffled egg toast at ‘ino in New York. See? Specific food memories. Things that, if I’m back in that town, I feel that I absolutely must eat them again. But when it comes to life here in Krungthep, I’m at a loss to name any specific “must eats”. Please understand, I really enjoy Thai food and, as Tawn put it, when I’m away, I miss eating Thai food when I am away from Thailand. But other than the sticky rice and mango place at the corner of Thong Lor and Sukhumvit (the best in town, I assure you), northing immediately pops into my mind. This also strikes me as an opportunity, a task to which I must devote at least some of my attention in the days and weeks to come. I need to brainstorm and if necessary, explore some more, in order to start building my list. I may already know of some places and all that is required is some gentle nudging to my memory. But I may need to start looking and tasting to see if I can build that list of “must eat” places here in the Big Mango. What about you? What foods and places are on your “must eat” list? Oh, the pressure of returning from holiday! Not only do I have to get back into the habit of cooking again (instead of just eating wonderful food prepared by others) but I also have to get back into the habit of finding interesting things to write about again, instead of just encountering a parade of them on a daily basis. It was nice to be back in my own kitchen, though. Admiring the efficiently compact kitchen at ‘ino in Greenwich Village, I returned home with visions of how I could add some stainless steel shelving, fit in a panini grill, and up my production capacity. Tawn probably wouldn’t appreciate my “function over form” remodel, though! Joanne Choi is a friend of a high school friend’s younger sister. She keeps a wonderful food blog called “Week of Menus” over at Blogger. The subtitle of her blog is “Good cooking for moms who have too much on their plate” and, as you can imagine, the emphasis is on healthy, whole foods combined with simple preparation. There is also a bit of a Korean overtone to many recipes, since that’s her heritage. A recent recipe that caught my attention was Turkey and Green Beans in Lettuce or Over Rice. 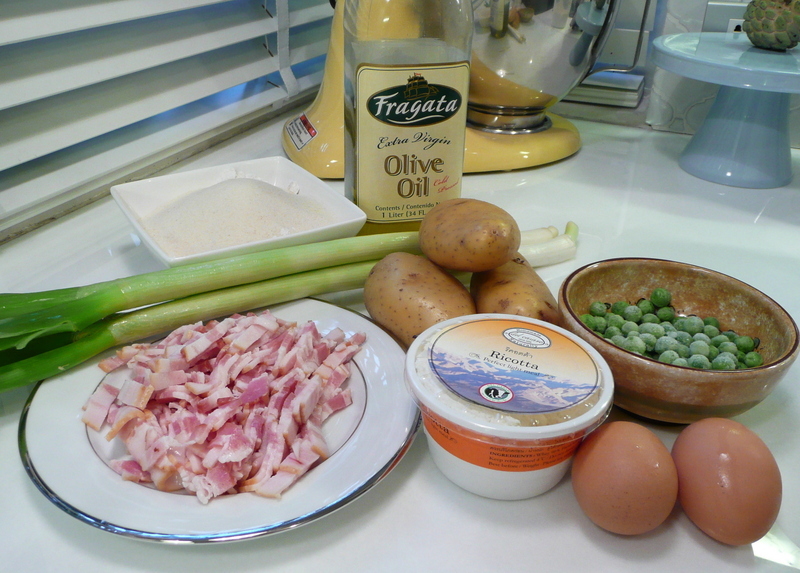 Now, as is often my wont, I begin to tinker with recipes before I’ve even cooked them. Ground turkey is an impossibility here in Thailand, but ground pork is readily available and tastier. And since she offered the option of serving the dish either in lettuce cups (ala P.F. 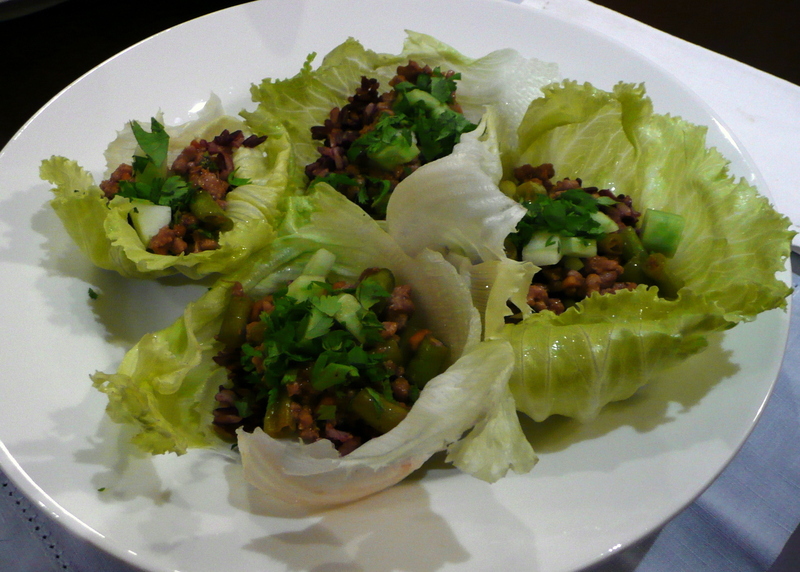 Chang) or over rice, I decided to combine the dish with a whole grain rice and serve them together in the lettuce cups. The results were fantastic. The combination of ground pork, green beans, ginger, garlic, soy sauce and hoisin sauce (with some chopped cilantro on top) is just super-tasty in a massively “umami” sort of way. Combine it with whole grain rice, which is nutty and satisfying, and it really was a whole meal in a leaf. I’ll have to try these again soon. Another option is to use water chestnuts instead of (or in addition to) the green beans. I couldn’t find them at the market, but I’m sure if I ask Tawn what they are called in Thai, I’d be able to run them down. One of my purchases in the US was the book “Kneadlessly Simple“, Nancy Baggett’s book of recipes for no-knead breads. I like baking my own bread and find that these kneadless options produce much tastier, “artisanal” style breads. So far I’ve made one loaf that was quite nice, although I botched the shaping and it came out lumpy. I’ll do another loaf today and see how it turns out.